In the preface to their book, Herman and Nilson note that there are not many book-length treatments of discussion as a teaching method; the relative few that exist focus on student participation and are primarily oriented toward small face-to-face classrooms. Other books feature discussion as one tool among many in the teacher’s toolbox, and again focus on getting students to talk. But, as Herman and Nilson write, “Talk alone is cheap” (xxiv). The fact that students are participating in a discussion does not necessarily mean that they are actually learning. In addition to questions of participation, treatments of discussion as a way of learning also need to take into account the variety of classrooms in which students are learning: large and small, face-to-face, online, and blended. This is what Herman and Nilson set out to do. 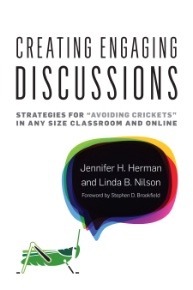 Chapter one lays out three common challenges of discussion in both online and face-to-face classrooms: inconsistent or uneven student engagement, lack of adequate connection between course goals and discussion content or process, and lack of assessment. Chapters two and three focus on student behavior, chapter four suggests a variety of strategies for ensuring that discussions advance learning, and chapter five details ways to assess discussion both for skillful student engagement and for clear connection to course content. Chapters six through thirteen are case studies, written by a variety of practitioners and addressing a variety of discussion delivery systems (face-to-face, online, and blended) and levels (undergraduate, graduate, and professional). The final chapter, written by Herman and Nilson, provides writing prompts, discussion questions, and workshop ideas that both teachers themselves, and those charged with the professional development of teachers, could use to engage with the book’s contents. Like many of Nilson’s previous books, this one is packed with information. As a practitioner, it is tempting to grab one or more of the discussion activities referenced in the quick guide at the front of the book and then return the book to the shelf. Doing so is a mistake precisely because of one of the ideas this book successfully advances: the need to align discussion content and process with course learning goals. This emphasis on alignment is one of my main learnings from the book, and one I will need to keep pondering and experimenting with. Each teacher must consider her course content, delivery system, institutional objectives and constraints, and student population in wisely selecting and applying discussion tactics to her particular circumstances. If I have one suggestion for the authors of this book, it might be to put the quick reference at the end to underline this point. I will confess that when I picked up the book, I was dubious about the value of the case study chapters for my work as a theological educator. What is the relevance of collaborative autoethnography to a class on Christian worship, or of course-based scientific research to a class on Christian formation? As I continued reading, however, the case studies underlined two of Herman and Nilson’s theses: the need for and value of learning from others, even when their circumstances are different than ours, and the benefits of a deep dive into a tactic rather than a quick ransack of possible takeaways. So having finished reading the book, I plan to read it again – this time with colleagues, and over time. Medhi Khosrow-Pour, editor; four associate editors; and over forty authors contributed to the volume Social Media in Education: Breakthroughs in Research and Practice. The authors teach and research in various contexts around the globe and as such the book provides insight into a multiplicity of learning contexts. Although much of the book reflects K-12 learning environments, there are several chapters specifically focused on the use of social media in higher education. Despite not focusing on higher education, many chapters have applicability for teaching with and through social media in higher educational contexts. The book is rooted in extensive research and organized into five sections: Curriculum Development and Instructional Design; Higher Education; K-12 Education; Language Education; and Reading, Writing, and Speech. Each section covers topics relevant to teaching and social media in a range of classrooms, online teaching and learning, and specific student learning issues related to the use of social media. Faculty teaching in theological school and university contexts will find sections one and two to be the most helpful (Curriculum Development and Instructional Design; Higher Education). The use of social media in everyday life is ubiquitous and this is underscored throughout this volume. The authors of Chapter 1, “Examining the Benefits of Integrating Social Media into the Classroom,” cite a helpful definition for social media by Bryer and Zabattaro as, “technologies that facilitate social interaction, make possible collaboration, and enable deliberation across stakeholders. The technologies include blogs, wikis, media (audio, photo, video, text), sharing tools, networking platforms (including Facebook), and virtual worlds” (2). 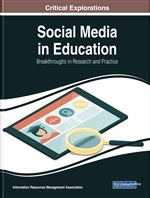 The authors of the first chapter examine various pedagogical theories in relation to social media in the classroom and conclude that connectivism theory is perhaps the most helpful. Their outline of principles of connectivism indicates that learning and knowledge rest on a diversity of opinions; learning is a process connected to varieties of information sources; learning may reside in non-human appliances; capacities to learn is more critical that what is known; continual learning is necessary; the capacity to make connections between fields, ideas, and concepts is a core skill; up-to date knowledge is vital; and decision making itself is regarded as a learning process (3). None of these conclusions are new. However, the focus on student continual learning and knowledge development through social media constitutes a new direction for thinking about what connotes knowledge, the acquisition of knowledge, and how teachers might foster student learning. One claim that this book asserts often is that social media facilitates active learning and collaborative learning. Resource and information sharing become a democratized project rather than being dependent on the authority of the teacher. In addition, the learning process can be more personalized and active. Co-created learning environments provide degrees of student buy-in that may have been somewhat absent prior to the introduction of social media in contemporary classrooms. The authors contend that creating communities of learners around shared interests fosters continuous learning and the potential for more positive learning environments overall. The authors of Chapter 2 also critique the current gaps in the literature around social media as an instructional tool. They claim there is a lack of information about how social media is utilized in classrooms, a lack of comparative research studies about best practices to develop and design social media strategies for classroom applications, and an overall need for alignment between social media use and assessment practices in classroom teaching (27). Yet, despite gaps in the research they claim, “by facilitating active learning, promoting affective learning outcomes, inspiring creativity and innovation, supporting team-based work, and creating a community of learners [sic], social media enhances [sic] students’ learning” (28). Chapter 3, “Utilizing Social Media to Engage Students in Online Learning: Building Relationships Outside of the Learning Management System” offers a foundational understanding of the history and role of social networking in student learning and provides specific insights about the benefits of social media use and instructor’s roles in relation to it. 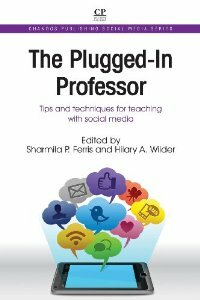 In addition, the chapter provides a couple of case studies for further reflection about the benefits and challenges associated with the use of social media in teaching. Areas of concern include: access to social media; privacy; time commitment for students and teachers; distraction and lack of focus; and integrity of the materials/content. The question of reliability or integrity of content and its quality requires teachers to help students gain capacities to differentiate content so as to discern what is reliable versus what is not. Social Media in Education also attends to the topic of social media and multi-literacy. It is concerned with understanding the varieties of learning domains that make up student’s learning matrices. The semiotic codes that make up multi-literacies are considered as variant domains of knowledge acquisition and construction. The book’s authors are aware of the multiple identities with which contemporary students navigate social media environments. Adapting and creating social media tools to meet student learning needs is also addressed. TeacherTube is one such example; developed to mirror YouTube and yet focusing exclusively on educational uses for classroom learning. It also indicates the learning level for which the videos might be applicable (K-12 or college). As the authors of Chapter 6, “Incorporating Students’ Digital Identities in Analog Spaces,” contend, “The advent of social media ushered in a time where multi-literacy became increasingly important, as social futures might ultimately be defined by one’s (in)ability to exist in both digital and analog worlds simultaneously” (98). As with any multi-authored volume on a given topic, there are many overlaps between the various chapters that can be repetitive. That said, the book provides a wealth of information about social media in relation to student learning and teaching practice in K-12 and higher educational contexts. One insight that surfaces throughout concerns how teacher intentionality about the use of social media for advancing student learning in any instructional context has a direct correlation with positive student learning outcomes. Aymerich-Franch and Fedele in Chapter 8, “Students’ Privacy Concerns on the Use of Social Media in Higher Education,” affirm that “undergraduate students generally accept the use of social media in the classroom but only when their use is justified and not linked to compulsory activities… students tend to use social networks to organize classroom work among themselves… Students are reluctant to use this social network [Facebook] for activities that involve interaction with faculty or to carry out subject activities organized by faculty” (142). Hence, there is a need for teachers to carefully select and navigate social media spaces in order to both recognize student’s private social media spaces as carrying certain learning capacities that may be outside of the teacher’s domain and to create social media spaces for specific learning activities that may be either teacher or student generated. One way by which teachers may discern what is appropriate for the use of social media in their classroom involves a brief questionnaire that interrogates their own use of social media in the classroom and that of the student’s experience with social media in the classroom (164). This can help teachers discern student familiarity with various types of social media in their own learning experience and aid teachers in discerning what might best meet student learning needs for their desired student learning outcomes. Perhaps one of the greatest strengths of this edited volume are the lists of references at the conclusion of each chapter. They constitute a gold mine for further research into the topics addressed and can widen and deepen one’s understanding of the use of social media in contemporary teaching practices for advancing student learning. Professors of religion and theology will not find any articles directly related to their respective fields of study. However, the book does provide a wealth of ideas that could be modified for teaching in theological schools and higher educational contexts. For example, issues related to the use of iPhoneography could have resonance with questions about hermeneutics and perception in general. In addition, the cost of this volume may encourage faculty to ask their libraries to purchase the book instead of adding it to their personal collection. Ferris, Sharmila; and Wilder, Hilary, eds. This volume is designed more like a handbook than a piece of prose. Aside from the preface that details how the volume is arranged and how each successive chapter is outlined, each chapter (twenty-five in total) represents a stand-alone essay that describes how an instructor can integrate a piece of social media into her or his curriculum and assignment portfolio. The essays are divided into four parts. The essays in Part 1, “Research, Writing and Information Fluency,” focus on applications of social media that challenge students to develop effective research and writing skills. The essays on “sharing” sites are of note because they offer instructors insight on how to use social media sites that students are already using to share research through bookmarking cultural artifacts. Part 2, “Communication and Collaboration,” is divided into two sections. The first section focuses on instructional communication through social media. Each social media outlet examined in this section is a communicative tool (for example, Wimba or YouTube) that can be re-allocated for educational purposes. The second section of Part 2 concerns issues of collaboration in terms of students working together on educational projects through social media tools such as Google Docs, study blogs, and group-designed wikis. Part 3, “Critical Thinking and Creativity,” is also divided into two sections. The first section considers how students can demonstrate critical (and, I might add, culturally perceptive) thinking through social media outlets such as Tumblr and Facebook. Students are challenged in these sections to examine social trends and personal expressions offered by users of these social media outlets to ascertain how persons learn and demonstrate social ethics or personal and professional development. The second section focuses on creative final course projects such as digital storytelling or video streaming presentations. Part 4, which concludes the volume, focuses on integrative learning, on integrating research, communication, collaboration, critical thinking, and creativity into one social media project. The final essay is of note here because it describes how students conducted a “social media campaign” through Twitter (xxvii). The students researched a client, communicated with opinion leaders in the client’s field, and promoted the client’s cause through critical reflection and creative engagement. The Plugged-In Professor clearly articulates that learning can be promoted in a host of ways through the use of social media. Therefore this is a valuable resource. The social media savvy instructor will be able to wade through the technical language with ease and find projects that he or she can use in class. However, the digital immigrant or digital alien may be overwhelmed at first. This volume can be read straight through, but one is likely to get bogged down in the various approaches and creative projects. It may be more helpful to read this volume like a tasting menu, sampling this Twitter-based exercise or that exercise for Google Docs. Perhaps it could be seen in a similar light as the Teaching Theology & Religion “Teaching Tactics.” Regardless of how one reads the material, the instructor should be careful to assess each project’s usefulness before implementing a social media project. The only real limitation to this volume is that the field of religious studies and theology was not represented, but religion and theology faculty can adapt these projects for their courses. For example, I was challenged by some of the essays in Part 1 to develop a wiki group project for my Pentateuch course. That said, it would be have useful and encouraging to see at least one sample of how social media has been used in a religious studies or theology course.